like on US 14A between Lovell and Burgess Junction in the Big Horn National Forest." Jim and I usually look forward to spending several weeks in the beautiful Bighorn Mountain Range each June to train for and run the Bighorn Mountain Wild & Scenic Trail Runs held in the middle of the month. It's one of the highlights of our summers. 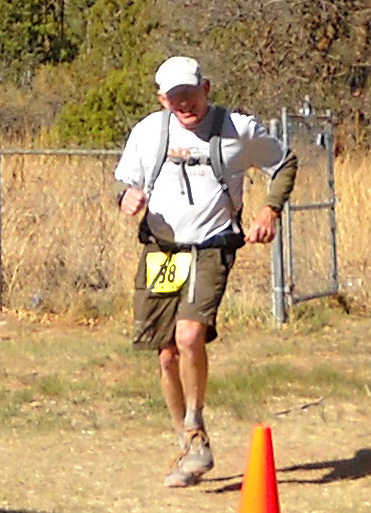 Jim's been going to this event since 1997; the 50K was his very first ultra marathon. My first Bighorn race was in 2000. We've been there many times since in the various ultra distances (50K, 50 miles, or 100 miles). Neither of us has run the 30K previously. 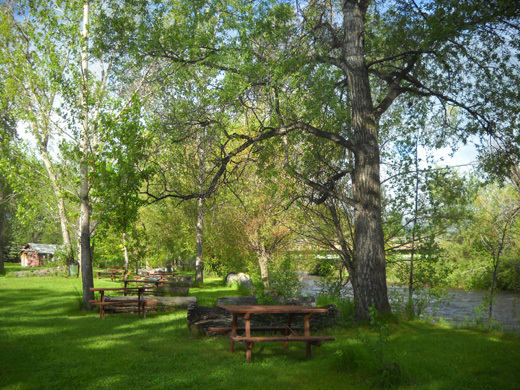 We enjoy camping at the Foothills Campground in Dayton, WY. We enjoy our training runs on the course in the nearby mountain range (well, except for the time Jim got bitten by a rattlesnake in the Tongue River Canyon!). We enjoy helping Karen, Michelle, Cheryl, Melanie, and the rest of the staff with the race. And we enjoy seeing lots of our running friends who travel to the event from all over the country. This year we were not so excited about coming to this event. No, we're not tired of it. It just seemed like there were too many obstacles to enjoy it this time. 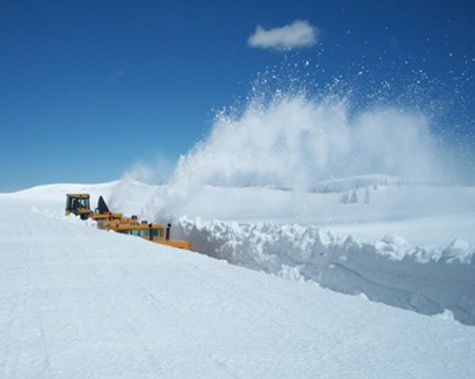 The past winter saw one of the heaviest snowpacks in recorded history along the entire Rocky Mountain chain (and other ranges farther west like the Sierras and Cascades). The Bighorns got from 200-400% of their normal winter snowfall. I read that some other areas received up to a whopping 700% of normal! That's pretty incredible, if you ask me. A bunch of that snow is still on the ground at elevations over 8,000 feet in the Bighorn Range. Even around 7,000-7,500 feet it's a mess in shady areas. Right now it is impossible to access or run/hike on much of the traditional Bighorn race course. Although the part of the course between Dayton (the start of the 100-mile race and finish of all four race distances) is only about 4,000 feet in elevation, the majority of the course for the 50- and 100-milers is between 8,000-9,000+ feet and parts of the 50K and 30K still have snow on them just four days before the race. Not only has that made a lot of us worry all spring about whether this race will even occur this year, it also seriously impacts how the course will be modified if it does proceed. 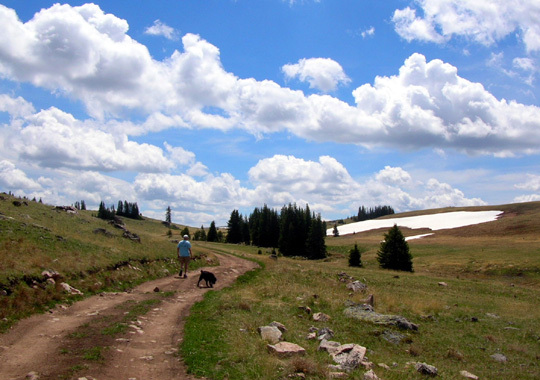 to access many of the usual aid stations in the Bighorn Mtn. Wild & Scenic Trail Runs. Today there is too much snow to run even the 2008 "snow course" for the three ultra-distance events! Even if the runners could get through the snow and mud on the course, race management hasn't been able to get in to clear or mark the higher parts of the course, aid stations can't be set up, buses can't take runners to the starts at Porcupine Ranger Station and Dry Fork, and crews can't get in without skis or snowmobiles. US 14A to the west of Burgess Junction was cleared only a few days ago but the Forest Service roads that lead to several aid stations, including Porcupine, are still buried under several feet of snow. It's sunny and very warm this week, however, and conditions are improving each day. The snow is melting pretty fast. Every year a lot happens between our arrival and race day. Race management has its collective fingers crossed! So do we. Which brings up the other major weather problem, flooding. In addition to all the snow that is still on the ground in the Bighorns (and other mountain ranges out West), a lot of snow has been melting recently and continues to melt later than usual. It has caused flooding in every drainage area below it. 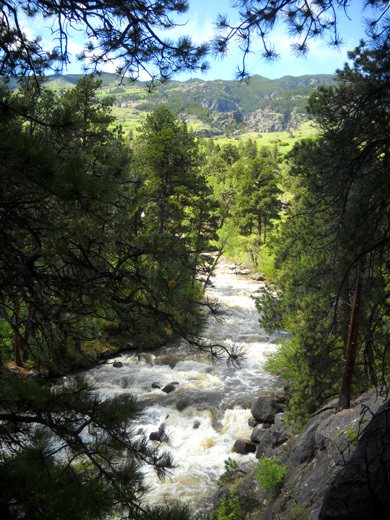 Creeks and rivers of every size on the eastern slopes of the Continental Divide are causing major havoc downstream, from their headwaters to the mighty Mississippi -- which certainly doesn't need any more water flowing into it. I imagine the same thing is happening on the western sides of the slopes, too. To compound matters, there has been heavier-than-normal spring rainfall, too. While we were in the Rapid City, SD area last week we kept reading and hearing about the flooding in Wyoming, Idaho, Montana, and the Dakotas. The entire Yellowstone and Missouri River drainages are a mess. Even most of I-90 was closed from Billings, MT to the exit just above the one we needed to take to get to the Foothills CG in Dayton, WY. We especially had to wonder about the Tongue River, which flows out of the Bighorns through Dayton right next to that campground. We've seen the river flooded before and now it sounded even worse. Would we be able to get into the campground? If we got in, would the river continue to rise and maybe trap us? Would we have to evacuate to higher ground in the middle of the night? Would it be too muddy to get the camper out after the race? All the snow melt and rain spells almost as much trouble for the Bighorn course as the high snow pack. 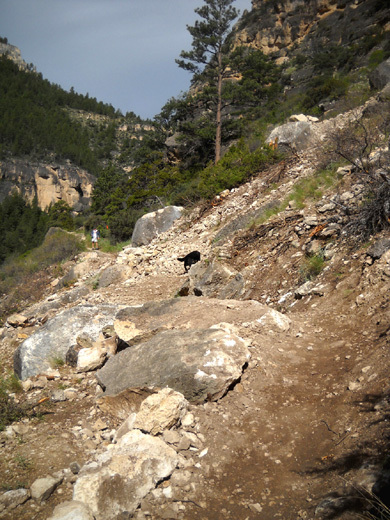 Not only are the trails below 8,000 feet even muddier than usual, there are numerous creek and river crossings. 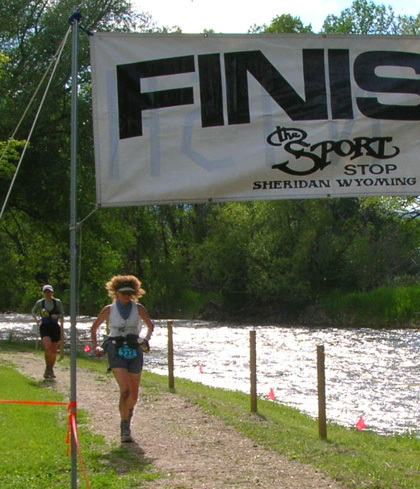 Sue finishes the Bighorn 50K in 2007 along the Tongue River in Scott Park. We wonder about bridges and sections of trail that may have washed out. We wonder if the race can finish at Scott Park in Dayton. The last five miles of the course are along the Tongue River; in some places the water is nearly lapping at the side of the road. In the park itself, the river covers the path at the traditional finish line. All this presents a myriad of challenges for race organizers, not to mention residents of the area. Jim and I like to get out on the course for two, three, or even four weeks before the race. 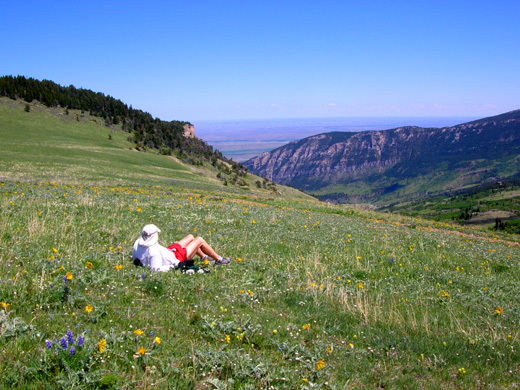 The Bighorns are a beautiful venue, especially when the spring wildflowers are at their peak. Most years they are spectacular before and during the Bighorn events (one of the main reasons they are held at this time of year). This year the chance of training on the course prior to the race -- and the likelihood of spectacular spring bloom -- has been dim. There was no incentive for us to arrive in the area more than a few days early. Yes, we're in Dayton now. We got here this afternoon, the Monday before the race, so we can get the cheaper weekly campground rate, have a chance to see the Tongue River Canyon and maybe Dry Fork, and volunteer for pre-race activities. 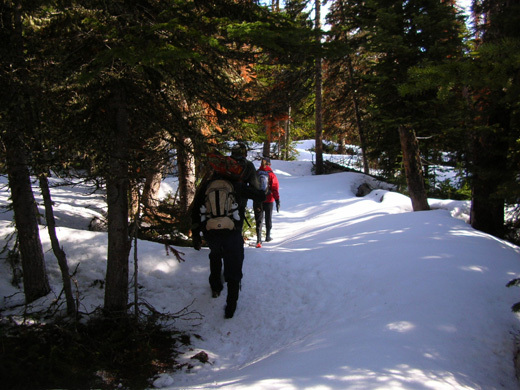 Ranger Station; this year the trail is buried under several feet of snow a week later. While we were in Rapid City we frequently looked at weather forecasts, read flood reports, and corresponded with folks in Sheridan (race management) and Dayton (campground owners and one of our running friends who lives in the area) to determine when to time our arrival in the Bighorns. We updated the NOAA weather sites for Dayton and Burgess Junction a couple times a day for warnings about flooding, snow, and possible thunderstorms. Lots of rain was predicted (and fell) for most of that time period -- not at all what they needed. Our original reservations at Foothills began June 6. Because of the snow, rain, and flooding we changed them to June 13 and remained in Rapid City a few more days. Even though we got some rain there, too, at least there wasn't any snow or flooding, the camper was sitting on a concrete pad (not grass/mud). we had lots of conveniences nearby, and Jim could continue training for the race. Jim enjoys the view from Horsecreek Ridge on the Bighorn course during a training run (6-5-2006). Now we plan to be in Dayton for just one week instead of several. If conditions were better, we might stay up here instead of going down to Silverton, CO to work the Hardrock Hundred and play in the San Juan Mountains -- they've got more snow than usual, too. But even after the race Saturday the Bighorn Mountains will still be a mess and we can't hike, run, or cycle like we want to. So we'll head to Silverton and see what we can do there. Hope that won't be a mistake! Meanwhile, race management has been saying that all four races will go on -- somewhere, somehow. They're as resilient a bunch of folks as most of the ultra runners who will show up. When we were in transit from Rapid City to Dayton this morning we got a call from Karen Powers, who is in charge of the race courses (routing, clearing, marking, etc.). Karen owns The Sport Stop and co-directs the race with her daughter Michelle and sister Cheryl. She knew we wanted to help with packet stuffing so she called to see if we were in town yet. I talked with her since Jim was driving. After we discussed the schedule for packing the runner bags, Karen told us about the course re-routes she and her cohorts had just decided on that morning. about a mile from the Porcupine Ranger Station. Jim also worked, and took this photo (6-12-2009). Karen described how it took her and her group of trail helpers over six hours on Saturday just to negotiate nine miles of Forest Service roads that access Dry Fork! 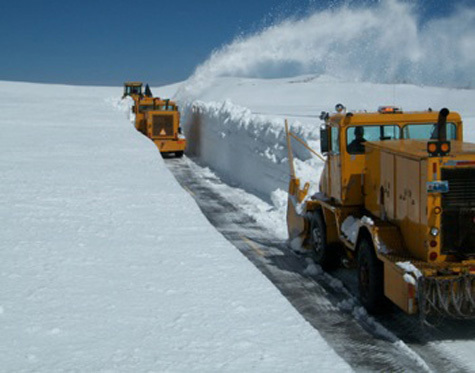 They had to get out of their vehicles repeatedly to shovel paths through the snowdrifts. Another day the group spent hours trying to move a car-sized boulder on the trail near Foot Bridge, which crosses the Little Bighorn River (they succeeded). 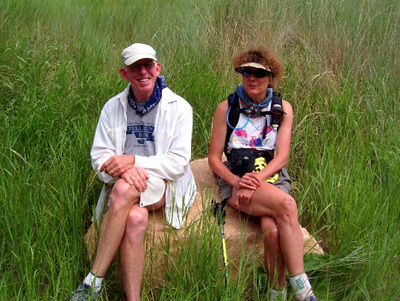 In addition, Karen and Wendell Robison scouted out a new section of trail from Dry Fork to Twin Buttes and back that will be used in the 50-mile and 100-mile races. An aid station will be located at the turn-around point. If the buses still aren't able to drive to Dry Fork on Saturday, the 50K and 30K runners will start from this new aid station, adding about three miles to the point-to-point 30K race. That won't disturb most 50K runners but some folks in the 30K may get distressed. There have been numerous other more expected obstacles like downed trees and small washed-out bridges to repair, too. 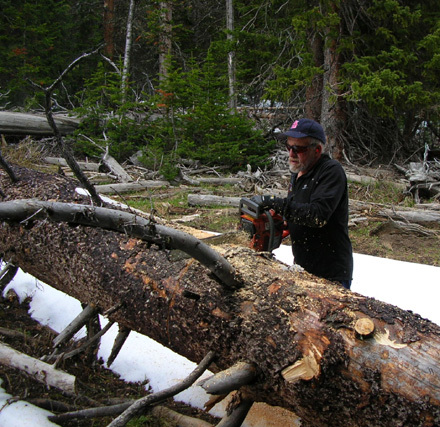 Rich Garrison cuts a large tree blocking the Bighorn course. Jim took this photo 6-12-2009. Jim has helped Karen with trail work like that several times previously but this year we weren't out here early enough. Instead, we'll assist with packing bags and runner check-in for approximately 950 entrants in the four races. I commiserated with Karen because I know it's very stressful to make all the decisions necessary to put on this race safely, especially with so many runners . . . in such remote territory . . . under such adverse conditions. Race staff also has to work within Forest Service constraints, finalize the re-routes, update the website so runners know what the changes are, relocate and reorganize several aid stations in the three longer races, pack supplies into the aid stations that volunteers can't access with their vehicles, and deal with questions and complaints from hundreds of runners. It would have been easier to just cancel the race, but that would have presented a whole new set of problems this late in the game. There's one more reason we aren't as psyched up as usual for this race -- Jim's knee is causing problems again and there is no way he can run the 50-miler. 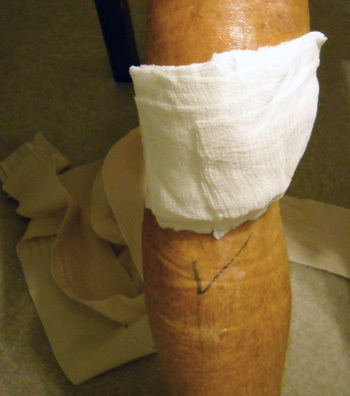 This is the knee he injured in a bike accident last November. He had meniscus surgery December 1, recovered fairly well, and resumed running later in the month. By February his knee was hurting enough that he sought medical treatment in the Houston area while we were campground hosting at Brazos Bend State Park. He also consulted with our orthopedist in Roanoke, the doctor who did Jim's knee surgery, when we went back to our house for a few weeks in the spring. The steroid shot Jim got from Dr. Johnson in late March worked well until a few days after the Jemez Mountain 50K in late May. Since then his knee hurts too much to run. He can walk a couple miles without pain but it's most comfortable for him to ride one of our bikes. Cycling doesn't hurt at all. 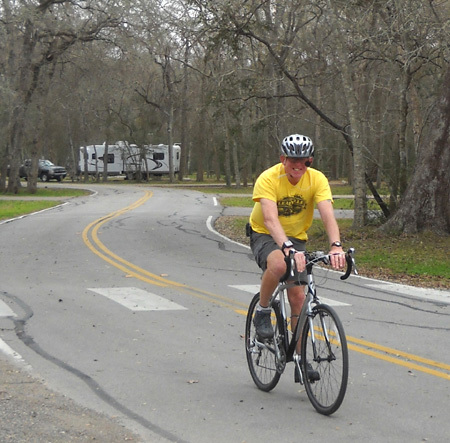 Jim rides my Specialized TriCross bike at Brazos Bend SP in Texas in March. The symptoms are somewhat different than they were at the beginning of the year. From January to March he had considerable pain when he was sleeping or sitting still; the some only time he slept well was with some type of sleeping pills. After he got the steroid injection in late March that problem resolved itself; he's been able to sleep without sleeping pills. He still has no pain when he is sedentary. Jim hit a low spot last week when we had two or three overcast and/or wet days in a row in Rapid City. Our moods were almost as gray as the sky (his mood affects mine). I think we would have been discouraged even if it had been warm and sunny. Jim wasn't sure what to do about his knee -- get another steroid shot? have another MRI? where? He was also very discouraged about not being able to run. Jim wants to be able to train for and complete the Bear 100 trail run in late September. Now he isn't able to run the 50-miler, and probably not even the 50K, at Bighorn. 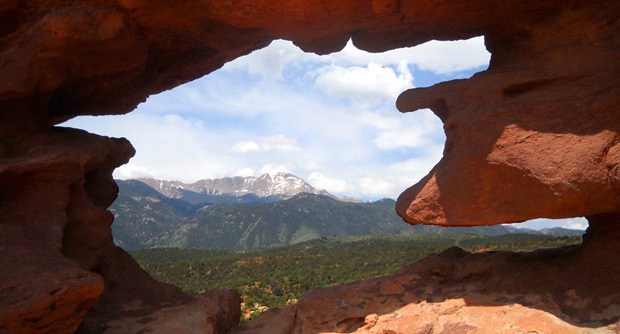 The Northfork 50-miler in Colorado on July 16 isn't looking too promising, either. 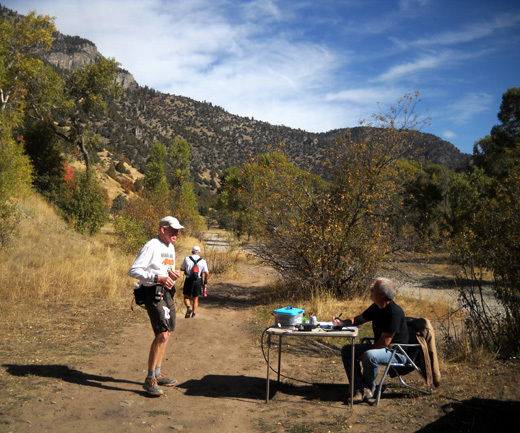 Jim talks with an aid station worker during the 2010 Bear 100 race. We talked and talked last week and came to some conclusions: Jim needs medical attention for his knee and he's more likely to get the evaluation and treatment he needs in a larger city than Sheridan, WY (closest medical facilities to Dayton). That fact also made our decision to go on down to Silverton after the Bighorn race easier. Silverton doesn't have any medical facilities either, but it's not too terribly far to Durango, where Jim can see an orthopedist. He contacted our orthopedist and general practitioner in Roanoke for referrals and made an appointment with the doctor they recommended. Both offices are sending the relevant medical records to an orthopedist in Durango who not only specializes in knee problems, he even does knee replacements. Hopefully, Jim won't need one of those! Just making this appointment and knowing he can discuss his problem with a competent professional next week has improved Jim's outlook. It's great that he was able to get in so fast as a new patient. Before we arrived in Dayton today Jim had just about decided to drop out of the Bighorn race entirely. Even the 50K isn't realistic right now. When I mentioned this to Karen on the phone this morning she suggested he just walk the 30K. We hadn't even considered that option but it makes sense. Jim's thinking about it. He'd have 11 hours to hike 18 miles and still be able to enjoy part of the course . . .